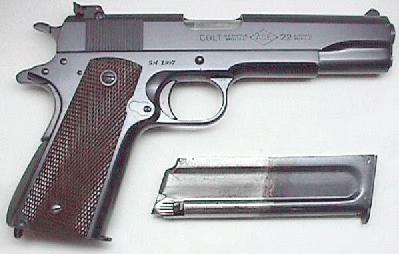 Colt Service Model Ace Serial Number SM1997. In a period casing with this gun is a numbered (sn U104) .45-.22 conversion unit. The gun was a single gun shipment on July 2, 1941 to Loan Account, Colt's Patent Fire-Arms Mfg. Company, New York, New York. Letter further remarks" "The records further indicate subject pistol was delivered to Major Thorne, British Purchasing Commission, New York, New York on July 22, 1941. There are no British Proof marks on the gun and it is suspected that it never left the United States. 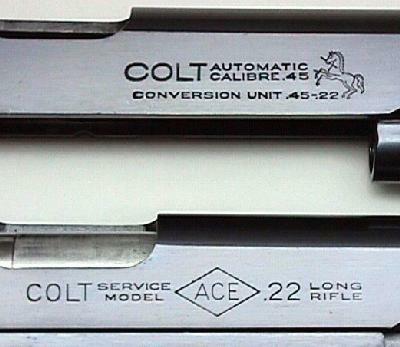 The conversion unit was shipped twice from Colt's with a final destination of H.D. Folsom Sporting Goods in New York. It is interesting to note that of the 100 guns between serial numbers, SM1900 and SM2000, that 87 of these guns went to Springfield Arsenal. This set belonged to George L. Graveson, who served in the OSS during WWII. His initials are on the end of the case. George Lewis Graveson was born March, 23, 1904, in Brooklyn, N.Y., the oldest son of Elizabeth and Eli Graveson. Growing up in Brooklyn, he worked as a messenger in the American Telephone and Telegraph legal department, from May 1918 to 1924. During this time, he enlisted in the U.S. Naval Reserve Force as a Fireman 3rd class. He reenlisted as a Radioman Second Class, and his enlistment expired in 1929. In February, 1930 he was commissioned Ensign USNR with a communications designator. Studying at night and perfecting his skill as a radio operator, in September 1924, he got a job with the United Fruit Company as a ship's radio operator. In March, 1925, he had the opportunity to go to work for the WEAF, a radio station in New York City. WEAF went to NBC in November 1926 and in September 1928, he joined Electrical Research Products International (ERPI), a subsidiary of Western Electric, the engineering division of AT&T. He married Gertrude Haff, a young nursing student in training at Brooklyn Hospital and moved to Amityville, Long Island. He worked for Western Electric and commuted to New York City via the Long Island Railroad. Graveson was active in local and church activities and kept busy with hobbies of fishing and Ham radio. In 1939, he was in charge of the audio portion of the General Motors exhibit, Futurama, at the New York World's Fair. At the outset of World War Two, Graveson took a leave of absence from Western Electric and went on active duty with the Navy, in July, 1941, first working in communications at Third Naval District Headquarters, 90 Church Street and then going overseas to England as Commander for Communications in the Office of Strategic Services (OSS). He returned home in 1945 and to the retired reserve as a commander. He took up where he left off in 1941 and once again took part in community affairs, becoming president of the board of education of Amityville High School. In 1954, he became Engineering Director of Radio Free Europe, with offices in Munich, Germany. Continuing in that position for four years. He retired from Western Electric in 1964, and began to spend winters in Florida, eventually moving to Plantation, Fla. full time in 1968. He set up his radio equipment and became a regular member of several Ham nets. He passed way on Feb. 8, 2000. Close-up of slide markings on .45-.22 Conversion Unit U104 and Service Model Ace SM1997.